Yes. 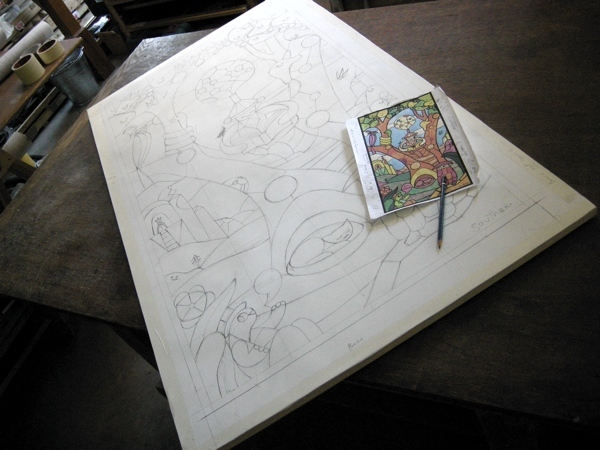 For instance we can work from a historical stained glass cartoon and copy anything you like. Another scenario is you have an artist or designer whose work you want us to re-interpret in stained glass: we can do this too. In 2012 we worked with the Californian artist, Souther Salazar, whom a London client had commissioned to create the original design. When Salazar had finished, we prepared a version that was suitable for glass. It does not usually reduce costs to work from existing designs. This is because it creates more work in other areas. Specifically, the design will nearly always be prepared with less understanding than is required of the properties of glass, glass paint and transmitted light. It is simply a different way of making what you want. So, if this approach interests you, write to me here.